Are Quarantine Tanks (Qt's) Necessary for Your Saltwater Aquariums? To better evaluate whether or not it is necessary to use a quarantine tank (QT), first, you need to know what one is and what its uses. This is a tank that is set up independently from an established or main saltwater aquarium, and as the word implies, it is used to "quarantine" any new fish an aquarist has acquired, before introducing them into the main aquarium. The number one reason for quarantining new arrivals for a two to three week period in a QT is to help to prevent the spread of any potential disease a fish may be carrying. There are those that feel a QT is a waste of time and money, the reason being that as long you have good water quality and a well-maintained aquarium, fish can stave off disease, parasites or infections on their own. In many cases, like with bacterial infections, this can be true, but after all the expense and time you have put into your aquarium community, why assume a problem won't spread? Consider this. When dealing with a disease such as saltwater ich, which is commonly associated with stress, that can quickly and easily spread and potentially wipe out a whole fish community in a very short period if not treated properly, why take the risk of possibly introducing something like this when it could be avoided by quarantining? Aside from preventing the spread of potential diseases, QTs have many other benefits. A QT is also used as a place to put and treat sick, diseased, harassed or weak fish that need to be removed from the main aquarium. If a fish does come down with a disease, it is much easier to control the effectiveness of medications in a QT than it is to treat it in the main aquarium. Since many medications can be harmful to live rock, corals or inverts, you won't be able to treat a fish while it is in your main aquarium anyway. 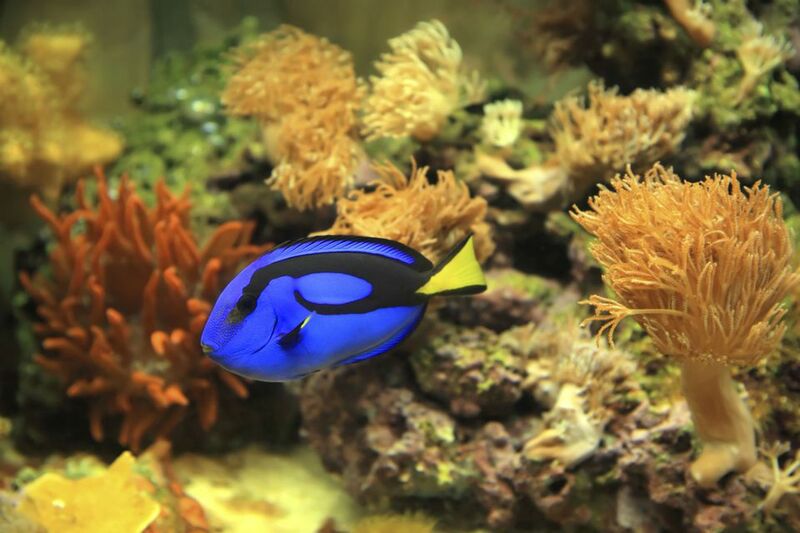 Some medications can disrupt the biological filter of an aquarium, or even destroy it all together. You can treat in a QT without harming your established aquarium's biological filter base. New fish are under the stresses of being transported, which can bring on disease and illness. By placing fish in a QT, this gives them time to recover from any stress, as well as acclimate and adjust to their new surroundings. Fish already established in the main aquarium may pick on a new arrival. It's hard enough for new fish to make the adjustments to a new home, and if fish are weakened by the stresses of transport or shipping, it is that much harder for them to fend off aggressors. By placing fish in a QT, they can regain strength and better defend themselves when introduced into your aquarium community. Placing fish in a QT gives you the chance to observe them helping ensure they are healthy and eating properly, and you can learn more about their individual characteristics during the quarantine period at the same time. There are different ways you can choose to set up a QT, but since most aquarists only purchase one or two new fish at any one time, 10 to 20 gallon sized tanks are a good choice. Here are some ways to set up a QT. Setup a bare bottom tank and provide adequate aeration and filtration. The setup can be accomplished using a compact hang-on-tank canister or wet/dry type power filter to provide mechanical filtration, as well as biological filtration if a few pieces of live rock are not available to put in the tank. Add a heater, thermometer, a single bulb fluorescent light hood for dim lighting, and some PVC pipe cuttings large enough for the fish to get in and out of for them to hide in. This type of QT set up is very easy to clean, maintain, and allows medications to be more accurately regulated. You can choose to set up a QT just like you would a regular tank and buy a good quality, complete aquarium set up. By setting up this way it looks nice, and if you decide you want another tank in the future, it already has all the components you need to convert it over. However, with this setup, the rocks, substrate and filter media make it harder to maintain the required medication levels when treating sick fish, particularly with copper treatments, because they can be absorbed by these objects in the aquarium. You can choose to purchase a mini-aquarium system that incorporates complete 3-stage filtration into one compact unit. These are ideal for using as a QT. A few good examples include; Current Cardiff 28 Gallon Aquarium System and Marineland's Eclipse Systems. When choosing a filter for the QT, pick one that is the same or very similar in structure to the one being used in an established aquarium that any seeded bio-media is to come from. For example; if using a wet/dry type filter with a bio-media chamber, use a similar type filter on the QT. It is much easier to place the seeded media into the QTs filter because it more closely matches the same type that is going to be used. When treating sick fish, they don't need to be subjected to any additional stress, and this includes notable changes in water quality. It is important to regularly test the ammonia, nitrite, nitrate and pH levels, particularly more often when treating the QT with medications, as many types will weaken and even kill the biological filter altogether. For this reason, you need to be aware of what's happening in the tank. It is smart to keep some AmQuel or another type of ammonia destroyer, or ammonia destroyer and some extra made up saltwater on hand, as these can be used to help reduce an ammonia spike quickly if this problem arises. The quarantine process is not necessary, and deciding to use one or not is up to you. However, after taking a look at the many benefits of a QT, it seems it would undoubtedly save you a lot of headaches and heartaches in the long run. Think about it. Isn't it better to be safe, than sorry?